Spa and wellness centre in Balneohotel Pomorie for SPA and recreation in Pomorie, Bulgaria. Spa and wellness centre of Balneohotel Pomorie offers SPA procedures, massages, mud and lye treatment, swimming pools, physiotherapy, hydrotherapy, magnetotherapy, kinesitherapy, etc. Pomorie resort combines the ancient traditions of mud treatment, with modern age medical and technological achievements, helping to establish a modern spa and wellness center in Balneohotel Pomorie. The qualified personnel will rely on this combination to give you the opportunity to revitalize your body and restore your energy, by rediscovering yourself in a place, far from the daily stress. Mud and Lye treatment: The Pomorie salt lake was formed as a result of an earthquake with catastrophic proportions, about eight thousand years B.C. The lime mud, which is formed there for many centuries now, is used for treatment of over 45 different medical conditions, related to the skeletal and muscular systems, the nervous system and the reproductive system, mainly due to the higher percentages of hydrogen, manganese, chlorine, calcium, sodium and sulfates in the mud. The mud therapies offered in Balneohotel Pomorie possess strong anti-inflammatory and pain-relieving properties, at the same time improving the metabolism. The lime is suitable for treating knee pains, coxofemoral joints, as well as back and spinal pains. One of the unique properties of the Pomorie salt lake mud is the positive effect it has on the reproductive system of the human organism, especially in the treatment of sterility. Gynecological mud application is suitable for the treatment of the female reproductive system, especially parametritis and sterility. The mud treatment center offers 18 individual compartments for mud procedures and two VIP rooms, equipped with tubs, capable of picking up the patient while he is in an upright position, and amplifying the effects of the mud treatment by wave-like movements, reminiscent of the sea waves. The mud is delivered to the center directly from the Pomorie salt lake, using a specially designed system for transferring mud. The center offers a lift for patients, which allows for problem free application of mud procedures for people with disabilities. Lye therapy: Compresses with lye, paraffin and fangoparaffin possess a distinctive anti-inflammatory, pain relieving effect, especially in the back area, the knees, the shoulder joints and the hands. In order to successfully apply those treatments, Balneohotel Pomorie is equipped with the latest in the world of technology. Swimming pools: Balneohotel "Pomorie" offers five swimming pools, which allow our guest to flirt with the water all year round and enjoy its medicinal properties. 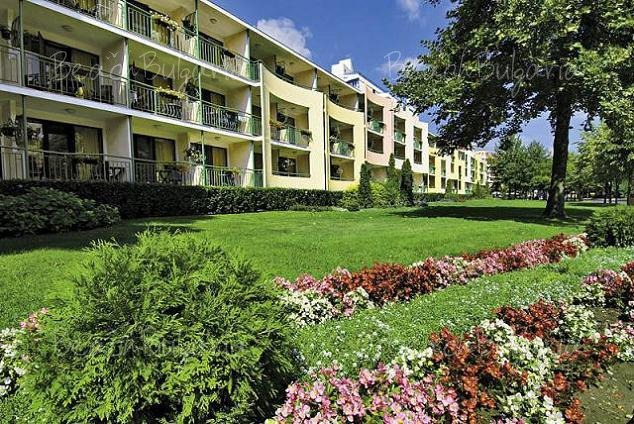 The hotel park has three open swimming pools, one of which is heated during the winter season and is connected with a 16 person Jacuzzi and a pool for kids, located inside the hotel. The indoor salt water swimming pool, using water from a Pomorie spring, is unique for the country. The water springs from over 70 meters beneath the surface, which guarantees a high level of purity. Its several times saltier than sea water, and possesses strong anti-inflammatory and pain relieving effects. The water improves the body metabolism. Its appropriate for treating knee pains, coxofemoral joints, back and spinal pains. Salt swimming pool: Balneohotel Pomorie offers to its guests the unique salt swimming pool with salt water from the Pomorie spring. The water comes from 70 meters under the surface and is 7 times saltier than the Black sea. The salt water has a strong curative effect on the human body. The usage of the pool has an extraordinary favorable effect on joint diseases and the rehabilitation of the muscles. 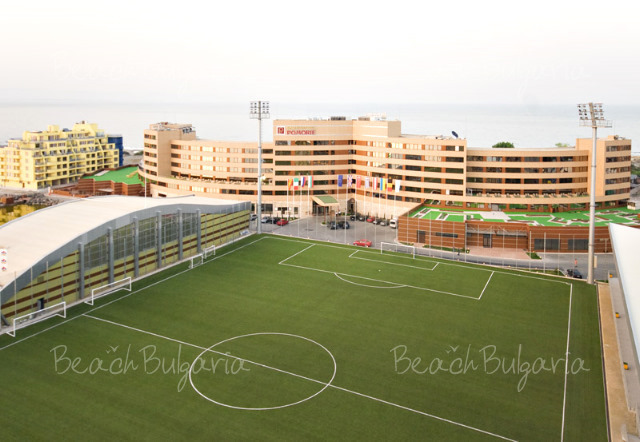 Physiotherapy: The center for physiotherapy is located on the second floor of Balneohotel "Pomorie". There are several rooms, equipped to offer low, high and ultrahigh frequency current tr eatments, which offer anti-inflammatory and pain relieving procedures, suitable for treating joint pains, otitis, sinusitis, tooth pains, stimulation of damaged muscular tissues and others. Hydrotherapy: The hydrotherapy center is spread across several rooms, located on the second level of the hotel complex. Our guests can enjoy hydro-massage tubs with underwater massage, carried out by our medical team, as well as the Tub of life, a unique equipment, which combines water massage, aroma and color therapy. The sound background, chosen by the manufacturers, transcends you in a place of peace and relaxation, somewhere where you can enjoy the harmonic solitude of your soul and body. Kinesitherapy: Take part in the group activities or talk with one of our kinesitherapists to create an individual program for medicinal gymnastics, analytical gymnastics and specialized medicinal gymnastics with mechanotherapy, for the treatment of diseases of the skeletal and muscular systems, such as coxarthrosis, discopathy, disc hernia and others. Massages: Relax, close your eyes and allow our specialists to take you into a world of pleasure, with two, three and six hand massages, which will diminish the strain in your muscles, remove the pain and make you feel good again. The products used are ether oils, which will restore the balance of your body, improve the condition of your skin, and tone and relax you. With our specialized equipment for mechanical massage we can treat different fat accumulations, at the same time stimulating the lymphatic and blood circulation. The tendon tissue is restored. The skin becomes smooth and soft. The pores become smaller. The procedure is painless and doesnt cause the formation of hematoma. Cosmetics: The skin has memories! It endures the effects of the everyday stress and the negative effects of the sun rays, as well as the hormonal disbalance of the human body. Our specialists will put you under a series of procedures and will prepare an individual program, which will revitalize your skin and bring back the feeling of natural beauty and freshness. Laser and puva therapy: The expensive high tech equipment of the center offers laser and puva therapy, which add to the uniqueness of the spa complex. Laser therapy is used where an anti-inflammatory and pain relieving effect is required, by using a laser beam for treatment. Its suitable for treating inflammatory conditions of joints, muscles and tendons. Cosmetic procedures. Puva therapy offers sector "A" ultraviolet light exposure, which has an extremely favorable effect over skin regeneration. Its mainly used for treating psoriasis. Magnetotherapy: Magnetotherapy has an extremely powerful anti-inflammatory and pain relieving effect in treating conditions of the skeletal and muscular systems, post-fractural conditions and diseases of the peripheral nervous system. Dentistry: The modern dental office offers treatment of all known dental conditions caries, pulpitis, parodontosis and others. The dental office employs modern x-ray equipment, which allows the dentists to quickly evaluate the condition of any tooth problem; tooth-whitening equipment and an intra-oral camera, which allows, over a direct internet connection, to contact your personal dentist, who can guide your treatment. Transcomtherapy: Transcomtherapy /hydrocolontherapy/ is a newly developed and extremely useful procedure for hydrotherapy of the colon, using water and water based solutions, using high-tech equipment. The aim of this therapy is to separate persistent and old accumulations on the colons surface, caused by modern processed food consumption. By undergoing this therapy, you will overcome the feeling of tiredness, depression, the lack of concentration, nervous conditions, aggression, migraine and skin inflammations. The therapy is extremely favorable for people with prostatic gland disorders, ovitis, intestine disorders, gas, liver diseases, kidney diseases, dry skin, eczemas, allergies, as well as a preventive measure against cancer of the colon. 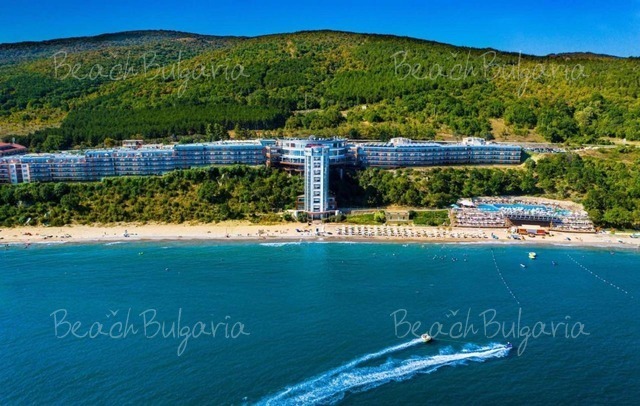 Please, post a comment on Balneohotel Pomorie Spa and Wellness.